Manta rays swim through the water with a flying motion, allowing them to travel quickly with little effort, while also being quite agile. These are qualities that would likewise be desirable in an autonomous underwater vehicle, or AUV. To that end, scientists from the National University of Singapore have recently developed a manta ray-inspired swimming robot, known as MantaDroid. 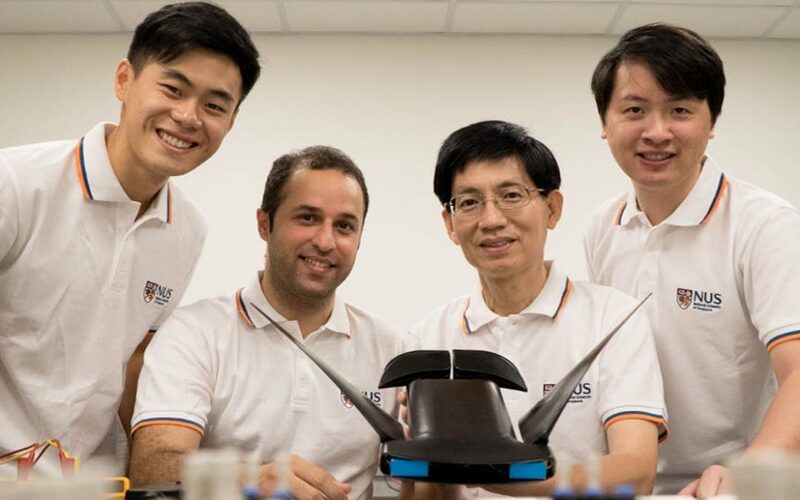 Created over two years by a team led by associate professors Chew Chee Meng and Yeo Khoon Seng, MantaDroid is actually modelled after a juvenilemanta ray – it measures 35 cm long by 63 cm wide (13.8 by 24.8 in), and weighs 0.7 kg (1.5 lb). The robot can “fly” underwater at a speed of 0.7 meters (2.3 ft) per second, which is twice its body length, for up to 10 hours on one charge of its batteries. Forty different fin designs were tried, before arriving at the current fins made from flexible PVC sheets.